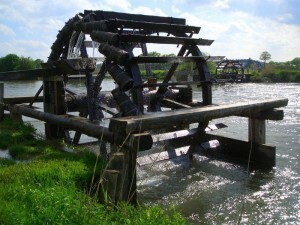 The water mill begins its diffusion in Western Europe. Water mills eased the work of grinding grain into flour and required far fewer people to produce similar outputs. This was important at the time because population decline (as a result of disease) and decreased dependency on slave labor had led to stark decreases in the labor force. The water mill spreads rapidly throughout Europe in subsequent years.